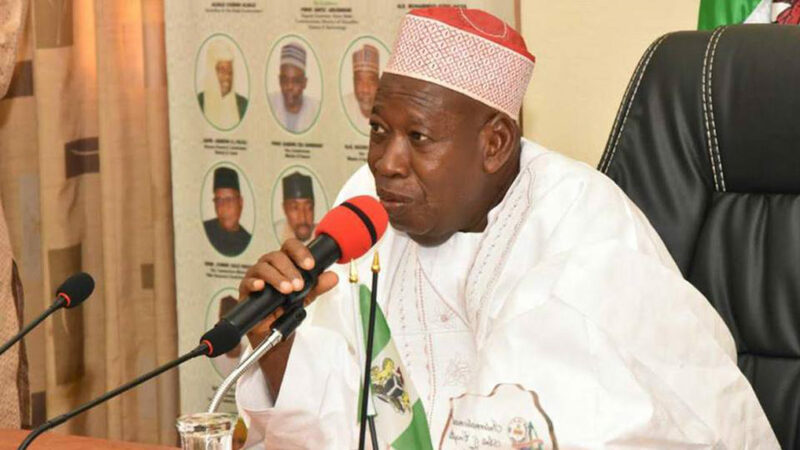 Kano State Governor, Abdullahi Umar Ganduje, Friday denied collecting bribe from any contractor. Daily Nigerian, an online newspaper, published the video clips showing Ganduje collecting and stashing in his clothe bundles of US dollar from someone purported to be a contractor. Although the governor failed to appear before the committee constituted by the state’s House of Assembly to investigate the authenticity of the videos, he was represented by Kano State’s commissioner of information, Muhammad Garba. Addressing the panel after submitting a written statement to the chairman of the committee, Bappa Dan’agundi, Garba denied that the Ganduje did not collect the bribe from the contractor as alleged by the publisher of the online Newspaper. He said the bribery allegation was aimed at damaging to his personality and that the allegation labelled against him are injurious. According to the document, the Governor stated that such had never happened to him and will never happened even in the future time. The Governor in the letter called on the public to discard such allegations as it did not happen and also called on such publishers to avoid such publications that can tarnish the image of leaders. “Such untruth publications was done to the Emir of Kano, Malam Muhammad Sanusi the II and also to the former Governor, Malam Ibrahim Shekarau”, Ganduje said in the document. Also commenting on the issue, the Commissioner of Justice Barrister Ibrahim Mukhtar and also the State’s Attorney General commended the way and manner the committee is handling the issue by given fair hearing to both parties. According to him, the Governor has options as stated in the letter presented to him on the invitation, as the committee given an option for him to send a representative or send a written document as provided by the Constitution of the Federal Republic of Nigeria. The Chairman of the Committee, Alhaji Baffa Danagundi, commended the represantative of the Governor for honouring the committee’s request. Danagundi said the committee will throughly watch the video on Tuesday in the presence of the representatives of both parties but not publicly. on October 15, the publisher/Editor-in-chief of DAILY NIGERIAN, Jaafar Jaafar testified before the committee and he insisted that the videos were genuine, and expressed readiness to swore by the Quran to convinced doubting Thomases.